Moving beyond "auto" on the white balance setting can enhance your photos. ﻿﻿﻿﻿﻿﻿﻿﻿Put simply, the white balance control is a feature on most digital cameras and smartphones that enables the camera to see and render colors as accurately as possible under varying types of illumination such as daylight, shade, clouds or fluorescent or tungsten lights. Accurate color is accomplished by the camera adding warmer- or cooler-colored filters to compensate for the inherent color cast (color temperature) produced by a given light source. A proper white balance can be attained by either manually choosing the appropriate white balance setting on the camera for the lighting you are shooting under, or setting it to “auto” white balance, which, in essence, “guesses” at the proper lighting. In most instances, auto white balance does a remarkably good job of giving us pleasing colors in a photograph, and in practice, many of us leave it on permanently, along with all of the camera’s other “auto” functions — and are more than happy with the results. However, you may find that by exploring and using the individual manual white balance settings, your final image may have more pleasing colors with greater aesthetic impact. An accurate white balance setting is especially important if you are saving your images as a JPG file and not as a raw camera file, which has the advantage of allowing the photo’s white balance to be changed after the fact with software such as Photoshop or Lightroom. One simple test to see the effects of different white balance settings is to look at a scene through the camera’s LCD monitor as you scroll through or change the individual white balance icons. You can actually see the change in color as you scroll or toggle through the icons. Typically, you would use the “daylight” setting to render the best colors on a typical sunlit day and use the other icons as your lighting situation warranted (cloudy, shade, tungsten, fluorescent, etc). In a daylight scene, try shooting one image with the “daylight” setting and shoot another with auto white balance. Depending on your camera, the results may look very similar, or very different. It’s your call as to which version you prefer. In situations where you may have a mix of light sources, such as the interior of a home with light coming through windows in addition to typical room lighting, most cameras provide a manual custom white balance feature that will give you an extremely accurate white balance by measuring the average color of the multiple light sources. 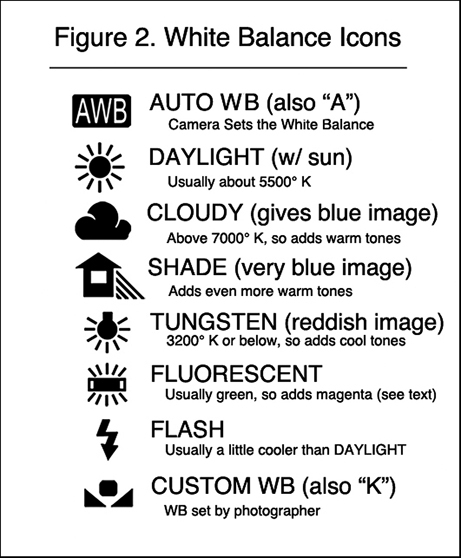 Consult your camera owner’s manual for information on setting a custom white balance. For the serious outdoor or nature photographer, using manual white balance instead of auto white balance can make a big difference between a so-so photograph and a great one. 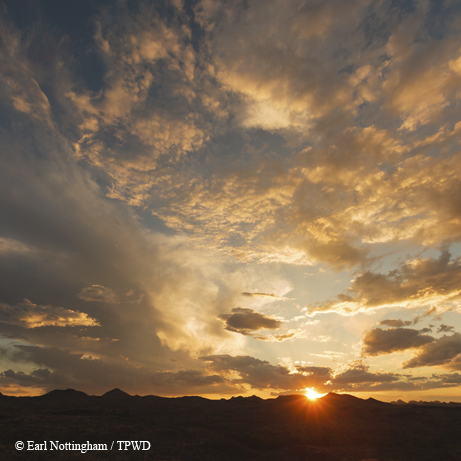 One common example is a brilliant red and orange sunset. On auto white balance, the camera doesn’t know that the scene is supposed to be predominantly warm-toned and tries to compensate to make the colors more neutral. This can result in losing the desired intense colors. 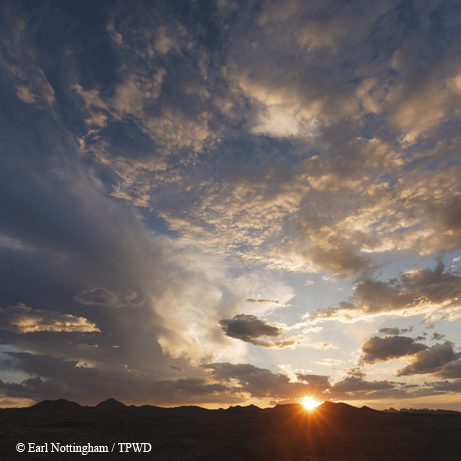 With a manual white balance set to “daylight” or even “cloudy,” the red/orange sunset will retain its brilliance. Hint: If you want to really enhance a sunset, set your white balance to the “cloudy” or “shade” setting since they both add additional warmth. Some photographers leave their white balance on “cloudy” all of the time to ensure a more aesthetically pleasing warm tone in all of their images. Today’s digital cameras and smartphones can take remarkably good images with their default automatic settings. However, to take your photography to the next level of creativity, try exploring all of the various manual settings your particular camera offers. It may just give you some new tools to see things in a different light.